No board game is more effective, and more efficient, at tearing apart families and friendships than Monopoly. 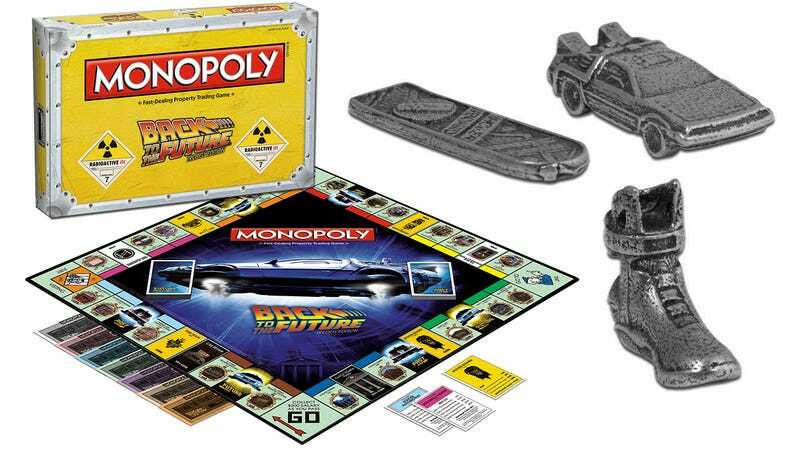 And with USAopoly’s new Back to the Future edition, you’ll be fighting before you even roll the dice as players attempt to lay claim to the DeLorean, hoverboard, or Nike powerlace sneakers tokens. The other three tokens—Einstein, a cowboy hat, and the clock tower’s timepiece—are slightly less desirable. But even if you get stuck with any of them, there’s still the consolation of getting to play on this Back to the Future-themed board. The properties are all taken from the three different eras in the film, with Boardwalk and Park Place being replaced with the 1885 and 1985 versions of Hill Valley’s Clock Tower. It also looks like this version of the game introduces Future and Past properties that presumably send a player’s token moving forward or back around the board.